Ooo - that eye shadow is a gorgeous shade! I love it too! I may just have to buy it or add it to my Christmas list. They have some other great colors on their website too. I already have a pink one. I want the eye shadow and the nail polish right now! I need me some Stardust eyeshadow!! Since my annual shoe budget isn't even $500 let me suggest these http://www.payless.com/store/product/detail.jsp?catId=&subCatId=&skuId=125268070&productId=71991&lotId=125268&category=&catdisplayName=Womens + glitter spray paint. 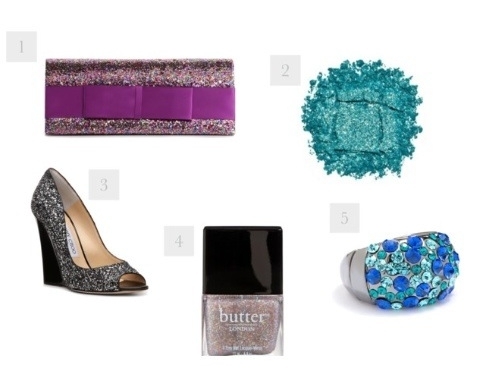 Now I know what to buy a fellow blogger - sparkly nail polish and glittery eye shadow! Mine isn't either Deirdre, but I wouldn't say no if someone bought them for me!